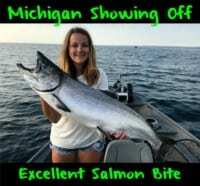 Michigan has a lot of excellent summer fishing opportunities. However, river fishing for fresh Chinook is one of summer’s most overlooked fisheries. Although these fish are weather dependent, great fishing is available when conditions align. Recently, we’ve experienced great summer king fishing in some Northwest Michigan’s lower peninsula. Roughly a week ago I noticed some weather coming that had potential to drive in fish. North winds, heavy rain and cool temperatures have a tendency to do so. 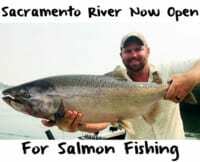 The north wind blew cold water in front of our rivers mouths, the rain raised river levels and the cooler weather allowed the water temperatures to fall enough to draw in fresh river Chinook. Many methods are effective on early kings, but my favorite is to float fish skein chunks and bags cured in Pautzke’s Fire Cure. The set up that I use is fairly basic, beginning with a 9’6″ medium-action St. Croix Wild River rod. This rod works great as it’s long enough to get good drifts, has great action, and enough backbone to handle these tackle busting fish. I spool up with 15-lb fluorocarbon, as I put my float on this piece. When fishing bags I run a 8g. float. Meanwhile, when fishing skein chunks I switch to a 20g float. Continuing with the setup, attach a small black barrel swivel to the 15-lb fluorocarbon and then tie on a two-foot, 12-lb fluorocarbon leader to the barrel swivel. When fishing bags run a size 10 nymph hook. However, skein chunks require a size 2 red treble. The reason I run a treble hook is because it holds skein better makes for a better hookset. I’ll attach the treble by using the snell knot, so it holds the skein on the hook better. For weight, adjust accordingly to river conditions. While I am running a 8g float with a bag, I generally run 6 bb shots, and space them out evenly, depending on how deep the hole is. Running skein, I will do the same thing, perhaps with bigger shots to get my skein down to the fish. Keep in mind, not every river is going to get early pushes of kings. Meanwhile, you can narrow it down by looking for cold water streams (trout streams) that connect to the Great Lakes. Salmon prefer water temperatures in the 54-degree range, so you will want to find a river that has temperatures near there. Judging by how big these early pushes of fish are I’m guessing the river salmon fishery coming up is going to be phenomenal. On the other hand, I think runs are going to be weather dependent for the next month until fall conditions arrive and Great Lakes tributaries see large returns. In conclusion, these early run Chinook are weather dependent. If you see the right weather coming it’s worth your time to check it out! If you don’t find fish at first don’t get discouraged! 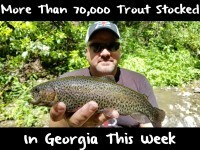 Not only have we been seeing a good number of fish, but the size has been big as well! We’ve been seeing many fish in the 20-30lb class! I really look forward to the upcoming fall fishery that our Great Lakes Region has to offer. The salmon are a blast to fish for. They fight harder than any other fish I’ve experienced in the region! Good luck to everyone on the water, as there are a lot of great fishing opportunities out there!